One of the most beloved concerts on the seasonal circuit, the Barra MacNeils East Coast Christmas features a highly entertaining mix of traditional seasonal fare along with entertaining stories and new musical twists; stamped with their lush harmonies and intricate instrumental stylings. Their show has been touring nationally, as well as in the U.S, for years to sold-out houses. Fans can look forward to classic favourites including: O Holy Night, Ave Maria, Christmas in Killarney and Auld Lang Syne as well as some comedy, seasonal stories, music, singing, dance and memories that will extend beyond the season and last a lifetime. The Barra MacNeils are widely regarded as one of the greatest live concert acts in the Celtic world. Their live performance offers a depth of talent that includes multiple lead vocalists, beautiful sibling harmonies, top-drawer instrumental talent on a wide variety of acoustic, stringed, percussion and wind instruments blended with dancing, storytelling, humour and Gaelic songs. It is family entertainment at the highest level. 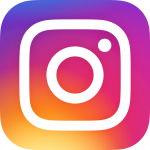 Halifax, NS, October 30, 2018 – Due to scheduling issues, the Barra MacNeils are moving their two Savoy Theatre Christmas shows from Saturday December 22 to Sunday December 23 at 3 pm and 7 pm. Tickets are now on sale for the new dates. Those who have already purchased tickets for the Saturday show can keep their chosen seats and should get in touch with the Savoy box office at 902-842-1577 to confirm. 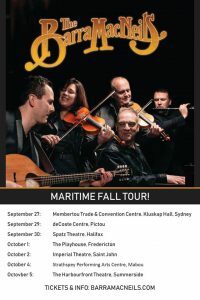 The Barra MacNeils are bring their new music to the Maritimes this fall! Hear old favourites and new songs from their latest studio album, “On the Bright Side”. Tickets and details on calendar page! *Sydney tickets will be available at a later date. Stay tuned. 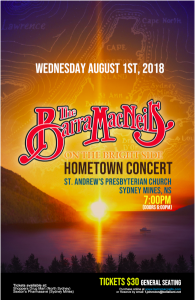 The Barra MacNeils have been at it for more than three decades and even after all that time, they are still a popular and in-demand group considered one of the best Celtic concert bands on the circuit. Celebrating that fact, the Sydney Mines family recently released a new CD, “On The Bright Side.” Recorded and mixed by Jamie Foulds at Sydney’s Soundpark Studios, the 10-cut project highlights their traditional roots but pushes the edges with some new material. 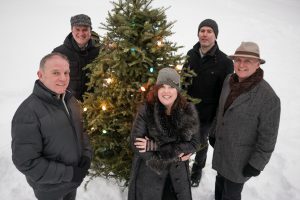 They’ve been at it for more than 30 years but there’s nothing like a new album to keep the Barra MacNeils’ spirits “On the Bright Side.”Lucy MacNeil says the new album has a more optimistic slant and as far as she’s concerned, the group has never sounded better. The album features a fan-pleasing mix of traditional instrumentals, some songs written by Stewart MacNeil, some songs written by other performers and a Gaelic tune, “Ribhinn Donn (Brown Haired Girl),” which MacNeil says has to pass scrutiny of a Gaelic speaker. Tickets are $30 for general seating, and the doors open at 6 p.m. with the concert starting at 7 p.m. They are available now at Shoppers Drug Mart in North Sydney, Pharmasave in Sydney Mines, or reserving by email at f.johnston@bellaliant.net or 902-736-2508.